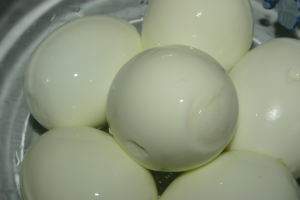 Many people do not know how long to cook hard boiled eggs. Simply place the eggs in a small to medium saucepan and cover the eggs with around two to three cups of cold water. Sprinkle a pinch of salt in the water and bring it to the boil. Now turn off the heat and leave the eggs to cook in the hot water for 15 minutes. Now your eggs are ready and you should run them under cold water for one minute. To test eggs, spin them around gently on a flat surface. They should spin freely and not wobble. A great way to use hard boiled eggs is in egg salad. Just peel and slice the eggs then toss into with iceberg lettuce and other desired vegetables. Eggs are a great food, full of protein. They are a tasty addition to various meals, but are a great breakfast food due to the amount of protein they give your body.